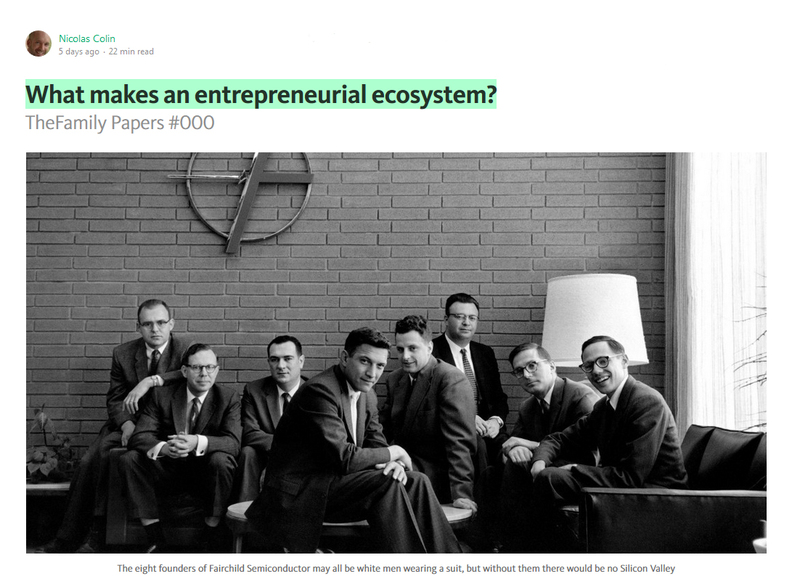 Great analysis by Nicolas Colin (The Family) in his article What makes an entrepreneurial ecosystem? If the topic interests you, it is a must-read. 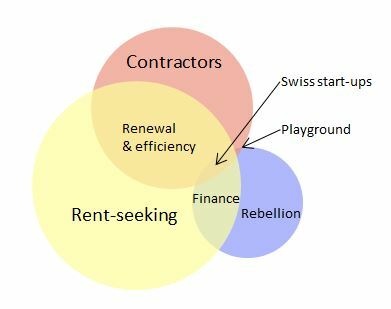 – rebellion: an entrepreneur always challenges the status quo. If they wanted to play by the book, they would innovate within big, established companies, where they would be better paid and would have access to more resources. 4. Service providers such as lawyers, head hunters, public relations and marketing specialists, auditors, etc. 5. Last but not least, an intangible yet critical component: a pioneering spirit which encourages an entrepreneurial culture. Finally, I copy his diagrams which show ideal and less ideal combinations of capital, know-how and rebellion, adding my exercise for Switzerland. “In Italy, for thirty years under the Borgias, they had warfare, terror, murder and bloodshed, but they produced Michelangelo, Leonardo da Vinci and the Renaissance. In Switzerland, they had brotherly love, they had five hundred years of democracy and peace – and what did that produce? The cuckoo clock.” in The Third Man, said by Holly Martins to Harry Lime. This entry was posted in Innovation and tagged Cluster, Ecosystems, France, Israel, Orson Welles, Rebellion, Silicon Valley, Switzerland on October 19, 2015 by Hervé Lebret. After my recent posts about Israel and high-tech innovation, I discovered I did know not very well the Check Point story. Start-up Nation did not provide much info and though you can find a lot on Wikipedia or on the Facts@Glance of the company. for example, I became a little frustrated when I discovered I could not find much about the company early days and IPO. I even had to buy the IPO filing through the SEC as the document is not public on the web and Check Point could not help me with such info. – the three founders had equal shareholding at foundation (and afer Check Point went public). – Gil Shwed, one of the co-founders, is still the chairman and CEO. Another unexperienced and young entrepreneur who grew his baby through adulthood. – Many women in the management of the company, Deborah Triant at the time of IPO, but even today Dorit Dor, Tal Payne and Juliette Sultan as the executive team page shows. (This may have to be linked to Israel culture again). Now the usual cap. 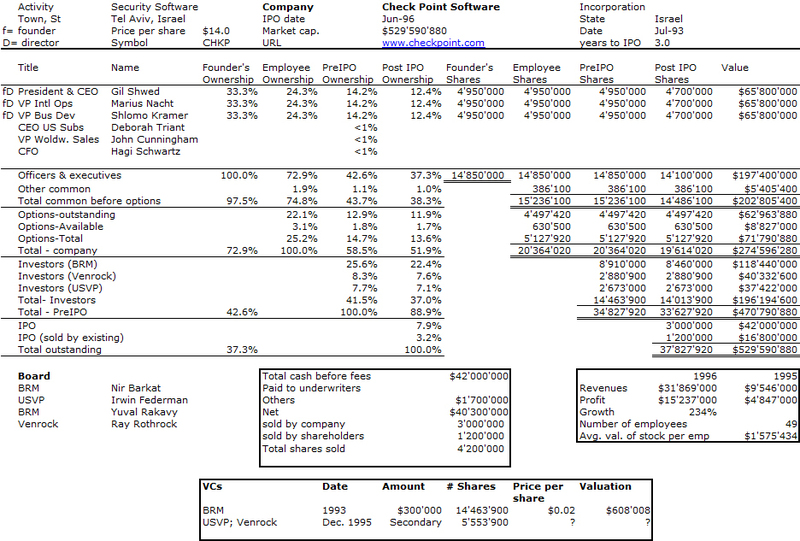 table that I could build from the IPO filing and the shareholding pies at the end of the post. 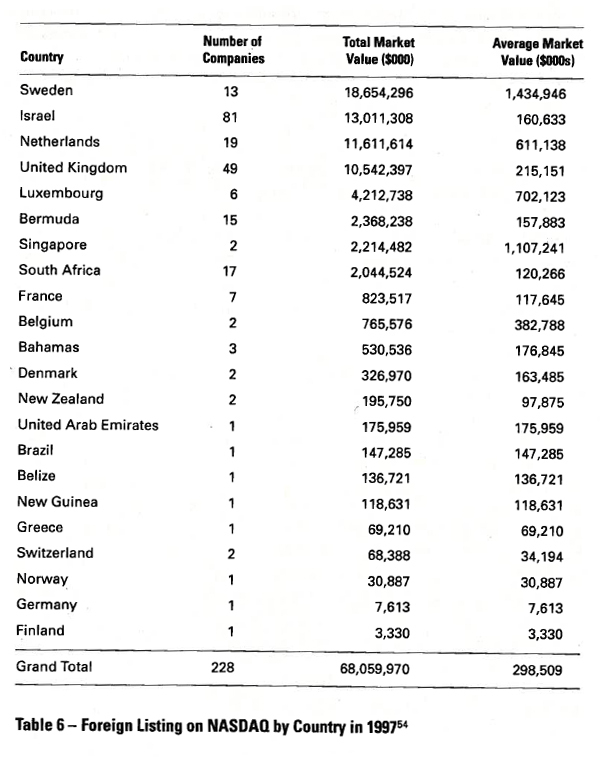 – What is interesting is that Check Point did not raise a lot of money, mostly $600k from BRM in 1993. There were also some loans ($400k) and R&D ($160k) from BRM also which do not appear in the shareholding. – The American VCs (Venrock and USVP) bought shares from BRM in a secondary financing, so there was no new money for Check Point. – Check Point issued 3M new shares at IPO and existing shareholders (BRM and the 3 co-founders) sold 1.2M shares. – Not the least impressive, it took the company 3 years only to go public and its 1995 and 1996 numbers are already impressive. This entry was posted in Start-up data and tagged Equity, Founder, IPO, Israel on February 22, 2011 by Hervé Lebret. 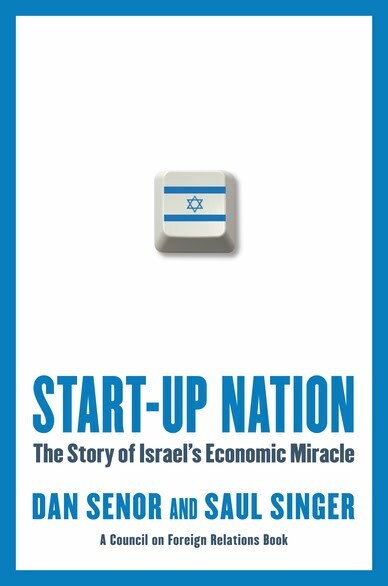 Thanks to an opportunity I got to meet with the Israel Chief Scientist, and the fact I was offered Start-Up Nation at the end of the meeting, let me give you my views on this very interesting book. But first a few things about Israel and innovation. 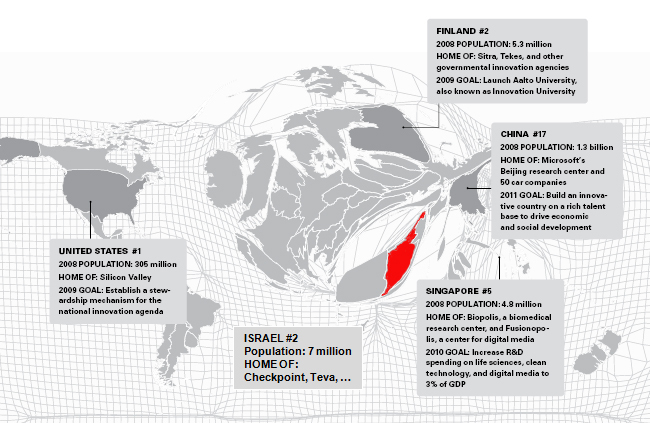 As the map (adapted from John Kao, Harvard and showed at the OCS meeting) indicates, Israel is an innovation superpower. Cisco, Intel, Microsoft, Novartis, Nestle and many others are located there. Check Point is just one of the many start-up success stories. Israel has more start-ups quoted on Nasdaq than Europe and venture capital is very active there. Finally the office of the chief scientist manages and funds the public side of innovation in Israel. 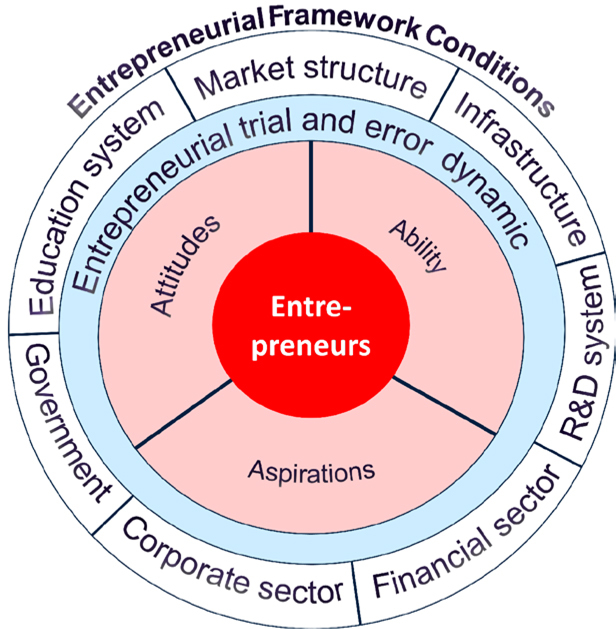 All this is perfectly analyzed in the book Start-Up Nation that I have just read. I thought I knew a lot about Israel, but the book is rich in anecdotes. The history of Israel is well described and innovation was probably a necessity to survive. If there is a point I appreciated less is the importance the authors give to the military. They may be right, that’s not the point, but I thought the topic came too often in the chapters. This remains a great book and a must read for anyone interested in high-tech innovation and entrepreneurship. I’d like now to quote a few things I liked. It’s not structured at all, but I invite you to read the book! The usual joke Americans need to put, but it is a good one! Four guys are standing on a street corner . . .
an American, a Russian, a Chinese man, and an Israeli. . . . The American says: What’s a shortage? The Russian says: What’s meat? The Chinese man says: What’s an opinion? The Israeli says: What’s “Excuse me”? – No inhibition about challenging the logic behind the way things have been done for years. – A rude, aggressive culture which tolerates failure. – People are mature earlier. – No need to wait for order to act. – Singapore’s leaders have failed to keep up in a world that puts a high premium on a trio of attributes historically alien to Singapore’s culture: initiative, risk-taking, and agility; in addition to being real experts who can improvise in situations of crisis. – Learn from mistake with no fear of losing face. – Fluidity, according to a new school of economists studying key ingredients for entrepreneurialism, is produced when people can cross boundaries, turn societal norms upside down, and agitate in a free-market economy, all to catalyze radical ideas. Sergey Brin spoke in an Israeli high school: “Ladies and gentlemen, girls and boys,” he said in Russian, his choice of language prompting spontaneous applause. “I emigrated from Russia when I was six,” Brin continued. “I went to the United States. Similar to you, I have standard Russian-Jewish parents. My dad is a math professor. They have a certain attitude about studies. And I think I can relate that here, because I was told that your school recently got seven out of the top ten places in a math competition throughout all Israel.” This time the students clapped for their own achievement. “But what I have to say,” Brin continued, cutting through the applause, “is what my father would say—‘What about the other three? – Dov Frohman – Intel – 1974 – Wikipedia link. Apparently Israel has been the core of Intel innovation in the past decade and Intel is the largest private employer in Israel. – Yoelle Maarek – Google – http://yoelle.com now at Yahoo! But one should not forget Mirabilis/ICQ (see below) or Check Point. Check Point was established in 1993, by the company’s current Chairman & CEO Gil Shwed, http://en.wikipedia.org/wiki/Gil_Shwed at the age of 25, together with two of his friends, Marius Nacht (currently serving as Vice Chairman) and Shlomo Kramer (who left Check Point in 2003 to set up a new company). Another member of the tech. 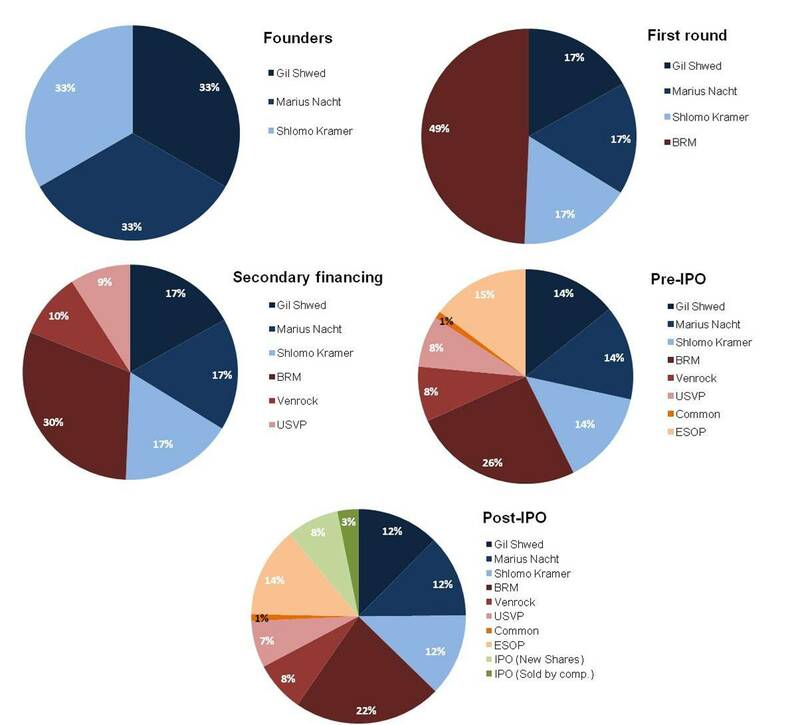 diaspora: Orna Berry – PhD USC – Unisys-IBM then Ornet and Gemini then OCS chief… The VC industry was really launched through the Yozma effort as well as Israeli incubators. Gemini was the first Israel fund. 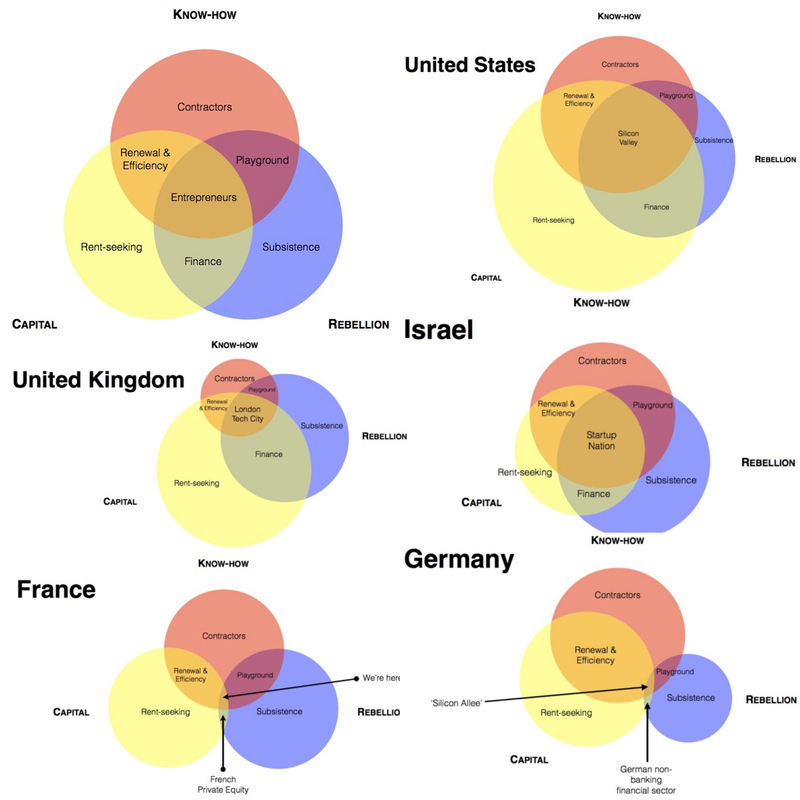 See the wikipedia article about venture capital in Israel. “There’s a multitask mentality here.” The multitasking mentality produces an environment in which job titles—and the compartmentalization that goes along with them—don’t mean much. The term in the United States for this kind of crossover is a mashup. And the term itself has been rapidly morphing and acquiring new meanings. … An even more powerful mashup, in our view, is when innovation is born from the combination of radically different technologies and disciplines. The companies where mashups are most common in Israel are in the medical-device and biotech sectors, where you find wind tunnel engineers and doctors collaborating on a credit card–sized device. Though Israel was already well into its high-tech swing by then, the ICQ sale was a national phenomenon. It inspired many more Israelis to become entrepreneurs. The founders, after all, were a group of young hippies. Exhibiting the common Israeli response to all forms of success, many figured, If these guys did it, I can do it better. Further, the sale was a source of national pride, like winning a gold medal in the world’s technology Olympics. “Indeed, what makes the current Israeli blend so powerful is that it is a mashup of the founders’ patriotism, drive, and constant consciousness of scarcity and adversity and the curiosity and restlessness that have deep roots in Israeli and Jewish history. “The greatest contribution of the Jewish people in history is dissatisfaction,” Peres explained. “So what is the answer to the central question of this book: What makes Israel so innovative and entrepreneurial? The most obvious explanation lies in a classic cluster of the type Harvard professor Michael Porter has championed, Silicon Valley embodies. It consists of the tight proximity of great universities, large companies, start-ups, and the ecosystem that connects them—including everything from suppliers, an engineering talent pool, and venture capital. Part of this more visible part of the cluster is the role of the military in pumping R&D funds into cutting-edge systems and elite technological units, and the spillover from this substantial investment, both in technologies and human resources, into the civilian economy. … But this outside layer does not fully explain Israel’s success. Singapore has a strong educational system. Korea has conscription and has been facing a massive security threat for its entire existence. Finland, Sweden, Denmark, and Ireland are relatively small countries with advanced technology and excellent infrastructure; they have produced lots of patents and reaped robust economic growth. 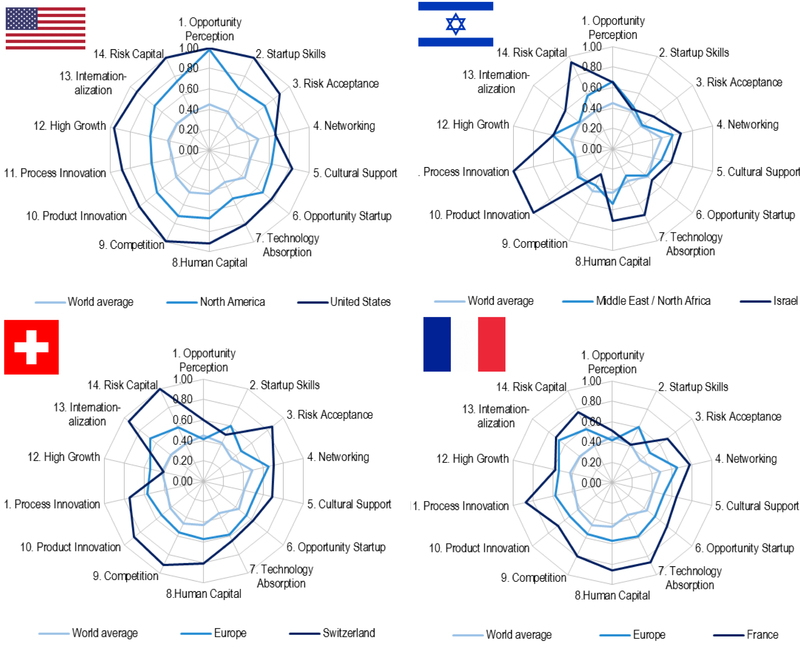 Some of these countries have grown faster for longer than Israel has and enjoy higher standards of living, but none of them have produced anywhere near the number of start-ups or have attracted similarly high levels of venture capital investments. What’s missing in these other countries is a cultural core built on a rich stew of aggressiveness and team orientation, on isolation and connectedness, and on being small and aiming big. Quantifying that hidden, cultural part of an economy is no easy feat. An unusual combination of cultural attributes. In fact, Israel scores high on egalitarianism, nurturing, and individualism. In Israel, the seemingly contradictory attributes of being both driven and “flat,” both ambitious and collectivist make sense when you throw in the experience that so many Israelis go through in the military. There is no leadership without personal example and without inspiring your team. The secret, then, of Israel’s success is the combination of classic elements of technology clusters with some unique Israeli elements that enhance the skills and experience of individuals, make them work together more effectively as teams, and provide tight and readily available connections within an established and growing community. If you have arrived here, you were interested enough in this long article. Logically, your next move would be to buy Start-Up Nation! This entry was posted in Innovation, Must watch or read, Silicon Valley and Europe and tagged Cluster, Failure, Innovation, Israel on February 5, 2011 by Hervé Lebret. I spent 5 days in Finland in mid-October and I came back with interesting lessons. But before writing about these in my next post, I would like to come back on the Israel situation which interestingly enough has been a strong model for Finland. 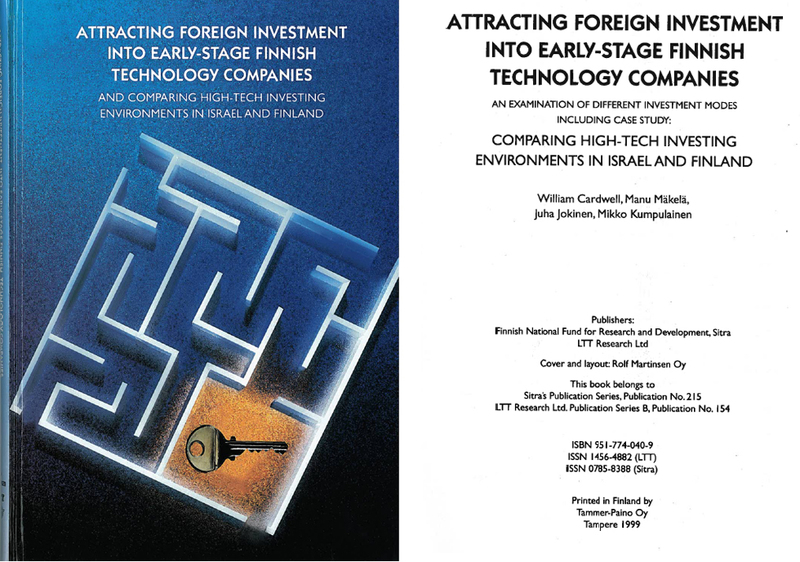 I had discovered the Victa report (you may see my older post) a few years ago and during my trip, Will Caldwell who had invited me to Helsinki offered me his book Attracting Foreign Investment into Early-Stage Finnish Technology Companies. 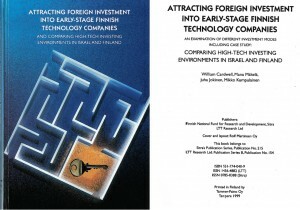 An Examination of Different Investment Modes Including Case Study: Comparing High-Tech Investing Environments in Israel and Finland. One of the strong features of the Israeli situation is how international their start-ups are. This includes international investors and also the fact that most start-ups have a US presence very early in their development. (They have fully digested the Go West I mentioned in my post of yesterday). And finally, the M&A and IPO ouputs are a by-product of all this. Will’s book was published in 1999 so it could look old, but it is not. Let me just show you a number of examples: one striking element which is not about Israel is a comparison of what entrepreneurs need and what local business angels (in Finland) can bring. 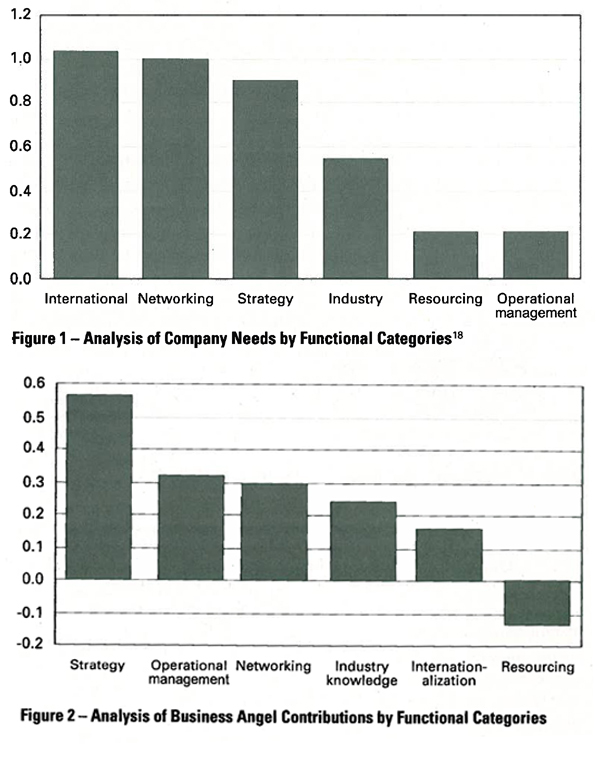 The discrepancy which appears was an argument for the need of international VCs. This may still be the case! – Table 6: Israel had more start-ups on Nasdaq than Europe as a whole. One may claim Europe has local stock exchanges but it would not change the success measure. – Table 5: The M&A activity mostly by US companies (of course). 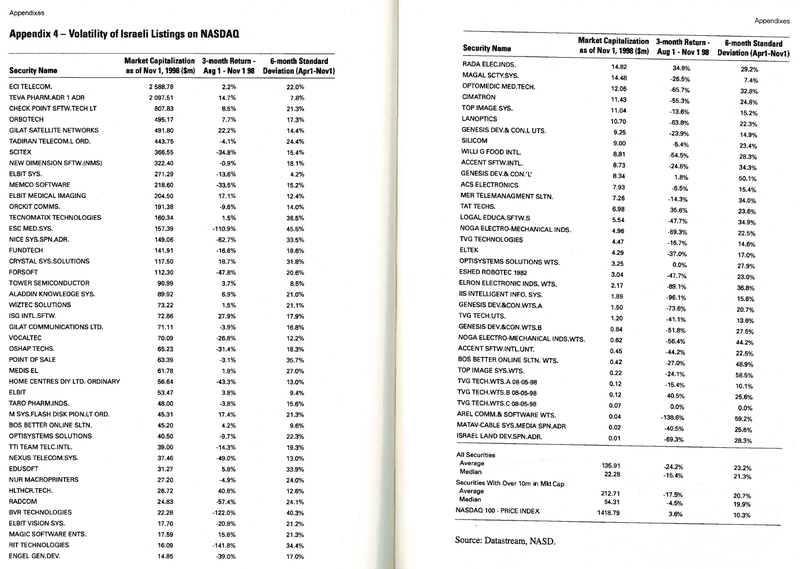 You could compare to my table about European M&As in my book. – Appendix 4: the Mkt. Cap. 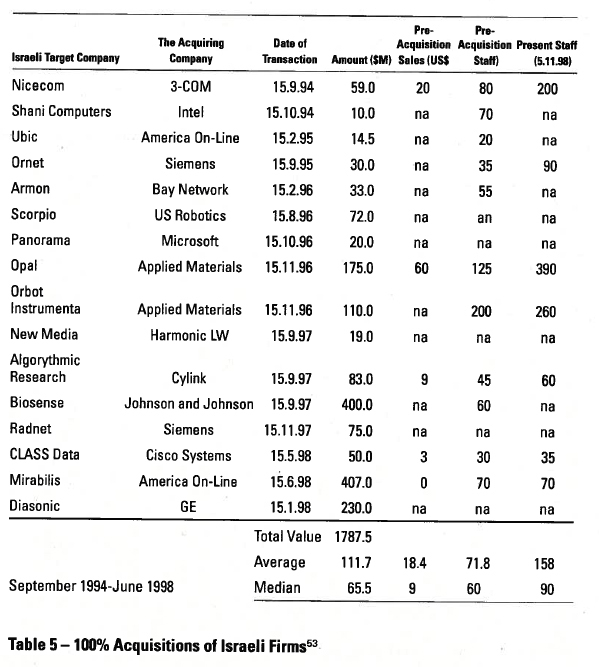 Of all Israeli Nasdaq companies in 1998. The results are obviously impressive but if you look closely at the volatilities, it also showed that the Israeli situation was diverse. Below, I just did an update of his tables. 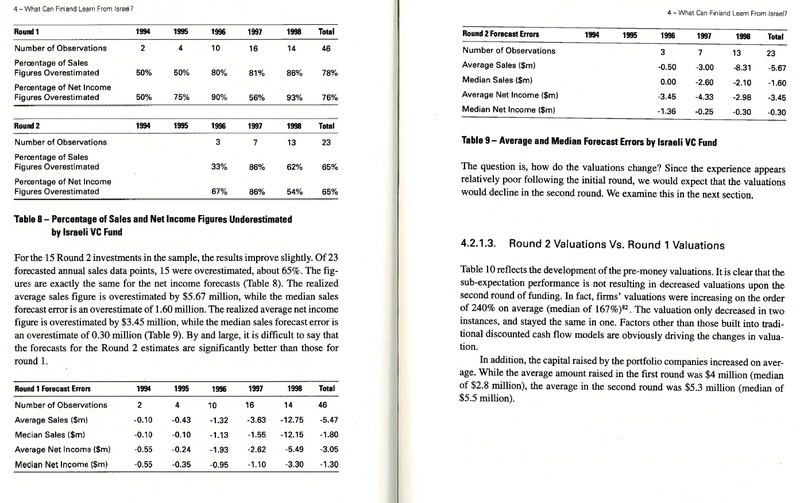 One final table I steal from his book is a comparison of what entrepreneurs claimed in the business plans and what really happened. Not surprising but I had not seen it so often. 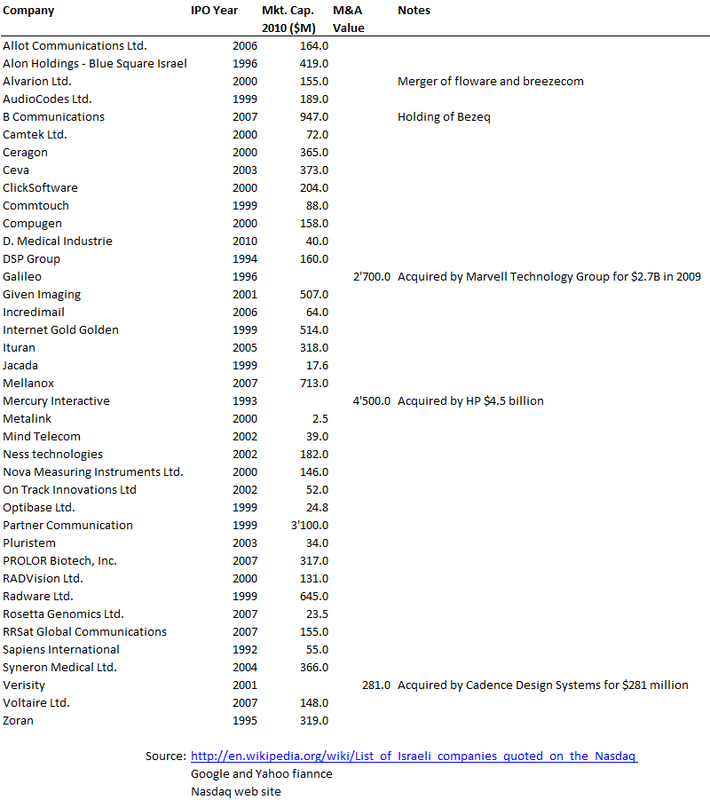 Now my updates of his tables: I looked at these public companies again. I used the Nasdaq web site and Wikipedia and then Yahoo and Google finance. So here are the updated values of the companies which were public at the time and the new public companies. 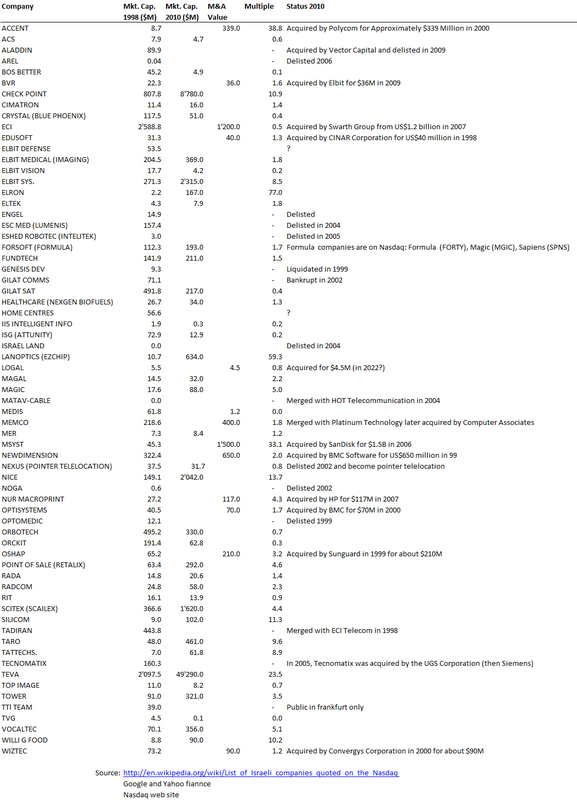 I have not done stats yet, but the basic description of all this is good enough I think! This entry was posted in Start-up data and tagged Finland, Israel on October 28, 2010 by Hervé Lebret.